A few weeks ago, in the run up to a discussion about the Border, I started kicking around an idea that I haven’t seen anywhere else. My friend Jason Evans has started prodding me to spit it out, so this is a first attempt, to which I hope comments and discussion will flush out a forming discussion about Jesus, the immigrant. I see at least two specific references to Jesus as an immigrant. The first practical, the second theological. First the practical, Jesus is a Galilean and is referred to as such throughout the Gospels. Our modern conception of nation states did not exist at the time of Jesus, so neither our modern conception of “immigrants.” However, Jesus and his followers are remarked upon throughout the Gospels as “Galileans” and have an outsider status in Jerusalem because they are from client kingdom in the North. This was not a positive association for the residents of Jerusalem. Jesus was thought of in Jerusalem similarly to how Mexican and other Latin American immigrants are thought of in the U.S. based upon “outsider” geo-political status. Now to the Theological, we learn in the prologue to John’s Gospel that “the Word became flesh and dwelt among us.” The Trinitarian’s “Son’s” experience is that of coming to dwell among humanity. This “dwelling among” might be faithfully rendered “immigrated to.” We hear in the prologue that ” He was in the world, and the world came into being through him; yet the world did not know him. 11He came to what was his own,* and his own people did not accept him.” Jesus’ outsider or immigrant status is confirmed in that his people do not recognize him. God’s identity in Jesus is as a stranger, an identity thrust upon him by those who do not recognize who he is. The divine is identified as an outsider, as an immigrant. Seeing Jesus Christ as an immigrant gives us a lens through which we see his action in scripture. We see Jesus consistently including outsiders in his ministry. He reveals himself to a Samaritan Woman as the Messiah. He includes Matthew the Roman tax collector, and Simon the Zealot among his apostles. He ministers with women, children, lepers, and gentiles. Understanding Jesus as an immigrant outsider helps to articulate the Christological reasoning behind the need for the inclusion of the outsider. Jesus himself was treated as, had the cultural identity of, the outsider. Beyond that Jesus calls his followers toward an immigrant identity. “Seek ye first the Kingdom of God” tends to be heard figuratively, but the connotation is that the follower of Jesus is constantly seeking a homeland that is not her own. Christians are all united in their common identity as immigrants to the Kingdom of God, the promised future country in which the poor are uplifted, the hungry fed, the sinful forgiven, the outsiders included. As followers of Christ we are called to be immigrants seeking the Kingdom of God. This issue is particularly salient in San Diego today because the Federal Government is planning to extend the double border fence and close off Border Field State park, the site of an annual Border Posada Pilgrimage. This park is one of the few places along the border that could be considered “proportional and humane,” the official wording of the Episcopal Church’s policy towards border enforcement. Family members can see one another through the fence, sit and have conversations. 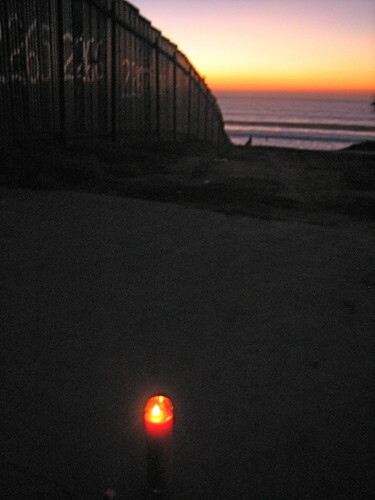 Every year hundreds of people gather on both sides for the Border Posada. The new fencing is being constructed without environmental impact study and with the Secretary of Homeland Security having voided all national laws pertaining to protecting the land including the Endangered Species Act, the Migratory Bird Treaty Act, the National Environmental Policy Act, the Coastal Zone Management Act, the Clean Water Act, the Clean Air Act, and the National Historic Preservation Act and others. Jesus would not have stood idly by in the face of this militant exclusion of immigrants. Indeed Christians cannot identify with the governmental and cultural powers that seek to exclude. St. Benedict taught that “All are to be welcomed as Christ.” If Judea had militantly walled out Galileans in the first century, Jesus’ ministry could not have happened. We are called to welcome the immigrants as Christ welcomed all, to see Jesus in the outsiders, and to follow the immigrant Jesus in search of a place where all are free, all are saved, all are loved; we are called to seek the Kingdom of God. Fantastic, Mike! You nailed it. Thank you for writing this! Hey man… you don’t know me, but I’m a sort of virtual friend of Jason Evans. If you’d be interested, I’d love it if you would submit this as an article on Jesus Manifesto…we have a wide reader base and I’d love to get our readers digging into this. If you’re interested, there is an article submission link at the header of our site (www.jesusmanifesto.com). If you’re willing, could you maybe tweak it in such a way that you end with some thought-proking questions for readers to grapple with? I’m with you; it’s time to act. I appreciate your article and your desire to open up dialogue regarding immigration. In my opinion Jesus was more a missionary than he was an immigrant. On the “practical” side, he and his followers were called “Galileans” when they were outside of Galilee but their intent was not to take up permanent residence in Jerusalem. If that was the intention of the disciples Jesus wasn’t for that as we see in Mat 28. In regards to the building of the fence you state “Jesus would not have stood idly by in the face of this militant exclusion of immigrants”, I disagree. Perhaps the method is not the best but Jesus was a respector of the law even though he knew it was a broken system – “give to Caesar what is Caesar’s, and to God what is God’s. I myself am an immigrant, I went to the US as a 14 year old boy from Guatemala with my family. I can recognize that for a few years I was in the US illegally, there is no other term to describe my being in the US w/out documents. However, I chose to work toward becoming a US citizen which I now am. I do agree with the fact that we are called to be citizens of Gods kingdom. Finally, one of the problems that many immigrants (specifically from Latin America) encounter is that they want to live in the US but not accept that as their home. Most are afraid that they are turning their backs on their home countries. I am in Guatemala as a missionary for four years, I haven’t forgotten about the land where I came from. You nailed it! I could not said it any better. I wish people would be more open to the truth. Comparing Christ to the modern day immigrant is comparing apples to oranges. You cannot use Christs’ mission to prove a Political point! I think Jesus came to show us how to love in his mission, of which you speak. If one truly calls himself/herself a believer in Christ, then politics should not even come to mind on humanitarian issues. Certainly there are bad people in the world; documented and undocumented. I shall love no documented person any less than an undocumented one. That’s just it. Jesus would not condemn a person seeking a better quality of life, even if it meant migrating “illegally,” as we humans erroneously interpret it. My name is Pablo Otaola. Thanks for your article. I have been thinking about this perspective for 4 years now and have been able to engage with others that think along the same lines… but more so with others that know that we need theology from the “margins” and “indigenous” theology from minority people groups. Dr. Soong-Chan Rah from NOrthpark Theological Seminary in “The Next Evangelicalism” points out that US Christianity has a Western Cultural Captivity that gets passed down from generation to generation that prevents the dominant Christian culture to create room for theology from below. In other words and as it relates to this article: How would it look like for an immigrant to read the Bible and form t theology from their context and life experience? We all view the world and read the Bible from our own context. As people from different contexts begin to dive into contexts outside of what is normal to them, there is a chance that their theological views are challenged due to different cultural perspectives. Jesus left wealth, power, and privilege to be among the poor. He suffered from the beginning by his life in poverty. He was persecuted by the authorities from infancy and his parents crossed into Egypt illegally (I’m sure they didn’t stop at the Egyptian immigration office, haha) to escape certain death of their son and to look for a better life. His mom was a teen-mom like most young Latina moms. He was persecuted all the time by the authorities just because he was being Himself; just because his perspective was different than that of the majority culture in power. He didn’t need to suffer. He chose to suffer. He looked at the systemic injustice of those in power and spoke against it. He was there in Numbers 12:1-12 when the first recorded act of racism by Miriam ended with her being plagued with Leprosy for 7 days. Jesus can’t stand racism. Jesus’ culture as a Galilean was not admired even though the culture in and of itself had culturally relevant compasses that pointed to the Imago Dei. Jesus suffered his whole life and then added physical, emotional, spiritual, mental, and cultural abuse to his resume on his way to the cross. Thanks for speaking about this!